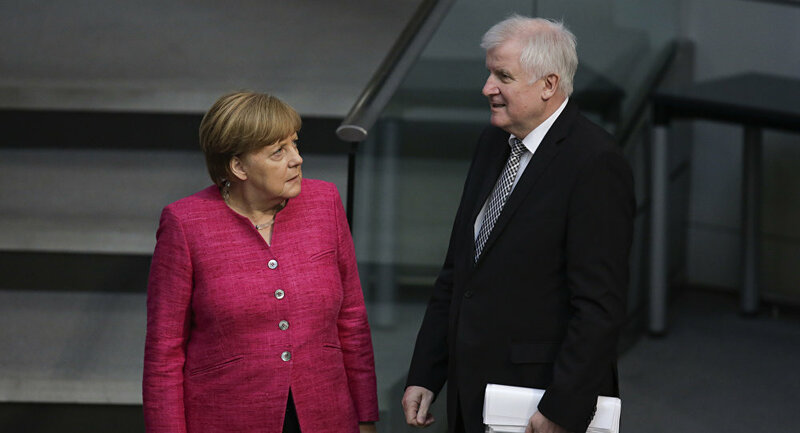 Despite major disagreements on migration policy between German Chancellor Angela Merkel and the country's interior minister, Horst Seehofer, both politicians seem to show a readiness to compromise. The Christian Democratic Union (CDU) leader, Angela Merkel, has announced that she agrees with Horst Seehofer, head of Bavaria's Christian Social Union (CSU), on further steps in the migration policy, citing a dispute that has jeopardized the decade-long alliance between their parties. The chancellor noted that both sister parties support Seehofer's "Masterplan for Migration" and have a common goal to better organize immigration in Germany, as well as significantly reduce the influx of refugees entering the country. The interior minister gave Merkel two weeks to negotiate a European solution to the migration crisis, an ultimatum accepted by the chancellor, according to the German DPA news agency. If, by the end of this period, Merkel cannot present an agreement negotiated with EU partners, migrants will be turned back at the German borders. On July 1, after the EU summit, Merkel is due to inform the CDU leadership about the state of her negotiations with the European countries that were most of all affected by the migration crisis. Seehofer, in turn, stated that "it is a scandal, if people banned from entry still arrive in Germany." The minister pledged to immediately instruct the federal police to change the situation. Previously, the union of the two parties, the CDU and the CSU, was on the brink of collapse, as the partners failed to agree over harder border checks proposed by Seehofer, since his stance contradicts Merkel's migration policy principle of "open borders." Seehofer's blueprint calls for some refugees to be rejected on the country’s national borders if they have already been registered in other EU countries. New figures from the EU Asylum Agency show that no where in Europe are there as many asylum applications as in Germany. With more than 222,000 requests, it is almost two times more than in Italy. Fifty-three percent of all refugees registered in the EU in 2017 live in Germany. Immigration policy is a burning issue, not only in Europe. US President Donald Trump has expressed his sympathy with Germans and blamed immigration for high crime rates in Germany. In another Twitter message, Trump added that he does not want what is happening with immigration in Europe to happen in the United States.